C.S. Le wis was part of a WWII-era literary group called the Inklings that included authors like J.R.R. Tolkien, Charles Williams, and Roger Lancelyn Green. Among those that I might consider “Honourary Inklings,” Frederick Buechner has, for me, pride of place. Buechner (pronounced Beek-ner) is an American pastor, writer, and teacher. In the literary world he is probably best known for his bestselling breakout novel, A Long Day’s Dying (1950) and his Pulitzer-nominated Godric (1981). I first encountered Buechner through his Bebb stories–brilliant short novels about a pear-shaped, bowler hat-wearing religious scam artist who still strikes the reader as utterly guileless and endearingly authentic. I soon stumbled upon Buechner’s sermons and spiritual writings, before I faced the task of reading his memoirs for Eugene Peterson’s “Soulcraft” course at Regent College a decade ago. I recently dug out my reflective response for that transformative class. Although I cringe at some of the writing, I am struck by how much these books gave me a voice for the various streams of vocation I was struggling with at the time. This response is a spiritual memoir of sorts, so the conversation is quite personal. But as I found that Buechner was telling my story at times, I suspect some readers will also find themselves in these words. Even from an author’s memoir, it is sometimes difficult to know the person behind the words. From a different perspective, though, everything an author writes is autobiographical. After reading Frederick Buechner’s four memoirs and some of his fiction, I am struck by the points of contact that exist between Buechner and me. While the details of our lives are different, on the whole our lives are not radically disparate. In fact, I often felt like he was telling my story too, and it is valuable to explore the encounter of imagination that has occurred in my reading. 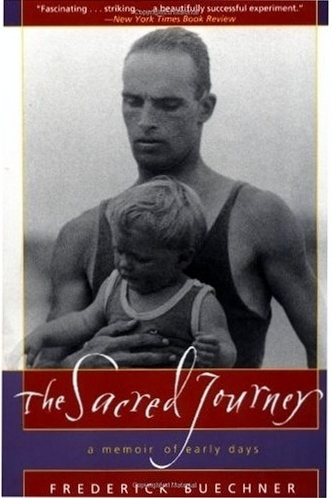 In Sacred Journey (1982) Buechner cleverly separates life into three periods: childhood before time began with his father’s suicide, adulthood where time is essential, and life when he began to see beyond time. The definitive point between my childhood and adulthood occurred when I was fourteen. My house caught on fire at 4:16 a.m. on February 4, 1990, and, as a result, my father and baby brother died. Unlike Buechner, my movement from childhood to adulthood to eternity happened very quickly, since I became a Christian soon after the fire. We both lost fathers when we were young, and we both experienced many of the same consequences of such a loss, but our paths of healing have been quite different precisely because of my early glimpses into eternity. Like no other time in my life since, God gave me a perspective that helped me see sunlight in the darkness. The theme of dark secrets runs throughout Buechner’s memoirs, culminating in Telling Secrets (1991). Buechner took a long time to find the courage to tell people about his father’s suicide. The death of my father was so spectacular that I never had to tell anyone. It made national news, and everyone in my town knew who I was. Teachers and counsellors and bosses I encountered during high school had been told in whispered hushes what had happened. I had a file. Eventually, though, people forgot, and I learned I had to tell the story of my pain. Though I did not realize this fact until years later, as a young adult I was desperately searching for a father. There is a sense where I share this in common with Buechner, but I think his search was more to know the father he had. I was a Christian by this time, and I had quickly discovered that most of my Christian mentors were willing to commit only to a very shallow level, and so I faced the darkness alone, without a father, allowing friends in only occasionally. Like Buechner, writing became an outlet for me. My imagination, and the imaginations of my favourite authors, became my mentors. Like Buechner, I loved poetry, and sometimes explored its depths, but I knew I was not to be a poet. I remember sitting on a stack of hay, procrastinating from feeding the cows when I was eight or nine, and waiting for the first star to come out so I could make a wish. I always missed the star, but that night I caught it, and I wished that I would become a famous writer. Aspirations of being an astronaut, a scientist or the prime minister slipped away with what some call maturity, but the dream of writing remained, and remains still. I wonder if Buechner had had other dreams fade until all that was left was writing. I had teachers encourage me here and there, but none such as Buechner had in his education—teachers who drew out his skills and tempted his imagination. When I was sixteen, I landed in a Creative Writing class that turned out to be a bird course. I decided to try anyway, and I wrote. My teacher, who had long since lost the “stuff” that teachers need to continue, was astonished that there was someone in the class who wanted to learn. So he taught me. He published my poems, and shared my stories with other classes. What I appreciated most was that he once told me one of my poems was not that great. It hurt, but he was right. In time I wrote about the fire. I was, however, writing with others in mind, not myself. This a trait which I think I share with Buechner. Even as I write this, I am aware and curious about the audience. I wonder what the paper marker is like, and whether he or she also connected with Buechner. I wonder if the reader thinks I have understood and reflected Buechner well, or if I am simply another freshman trying to impress the world. I wonder what mark I can get, and whether I should alter my writing and reflection style to get a better grade. More than just in writing, this sense of seeing myself outside of myself is an area I share with Buechner. I think that he fears he is a bit of a fake. In prayer, in relationships, and in my work, I have this sense of being watched or watching myself. Sometimes it is like I am performing for others, writing for others, preaching for others. I do not know if I am being a fake or if this feeling may be a normal part of life. Before I read Buechner, I had never met anyone who shared similar thoughts and feelings, let alone someone able to articulate the feeling so well. I had decided long ago I wanted to capture people’s imagination in novels, and quietly feed their captured mind meals of love and grace and redemptive pain. I am now curious about his other writings. I have read Buechner’s Bebb books and his four memoirs, but was he as successful in capturing the themes of his faith in his other books? How did his readers react to his change of worldview when he became a Christian? As a fledgling writer, I am extremely grateful for the tales of his experiences, but I am still left with many questions. 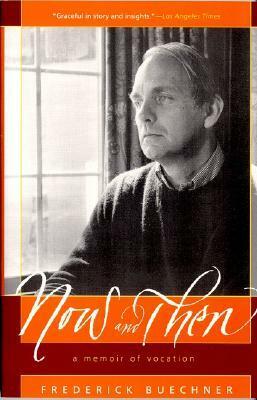 Though Now and Then (1983) is primarily about his vocational life, Buechner does not share enough about how ministry and teaching and writing fit together. This is a little disappointing because these are the vocations I want to hang together in my life—and I have the sneaking suspicion that they do not hang together perfectly. I am left hungry for more about his vocational experiences. Underlying all of Buechner’s remembering is theology. He teaches in narrative, and entertains in his sermons. He captures my imagination, drawing truth out of images that have long lain dormant. His approaches to teaching and preaching–particularly his choice of language and perspective–are what I am trying to do. The difference is this: he began teaching the way he did partly because he did not know any better, whereas I have to intentionally break habits of fundamentalist language and a narrow worldview. He makes a good study of how to do what I am trying to do because he lives it. He believes that theology is autobiography, and I believe he may be right. One of the key points of theology that has come out of Buechner’s writing is the truth about the providence of God. I have also seen the providential hand working in my life in timely tragedies, camps, sermons, and coincidental meetings. Unlike Buechner, these have been large, pivotal events, not seemingly small ones. While there have been some small events that have turned out to be quite important in my path, my life instead has seemed to include sweeping changes of direction, not just little turns in the road. My start in ministry, like Buechner’s, was somewhat accidental. Though I had a sense of pastoral call, I had not followed that up with any career decisions. I surprised myself and everyone else one day in high school when I said “I want to be a youth minister.” I did not know what a youth minister was, but there was a Pastor’s kid in the discussion who clarified that a youth minister works with teens. When Buechner describes in Now and Then his mixed feelings regarding the vocation of helping the down and out in East Harlem, I understand his feeling. Each morning I wake up to see the volcano Mount Asama overshadowing a lush valley of rice fields and small Japanese towns hedged in by mountains and forests. There is a beauty here that people search their whole lives to find. I live among a people who have never known about Jesus, and most of them will die without knowing Him. I know that we are not supposed to be here for long, but I feel myself being called to stay–not by the Lord, but by the reality of what could be done. And so Mt. Asama haunts me each day like the man on the street corner who Buechner helped find a job. I hesitate to say it, but I may share some aspects of darkness with Buechner. I hesitate because I am unsure to what degree he struggles in this area. If it was not for Telling Secrets, I would have suspected he slid through life without significant inner pain. There is a time when Buechner’s memories and imagination turn in on himself, which kept him from seeing the truth about his life, his mother, his daughter, and his father. I cannot imagine that someone with his imagination and reflective ability can have escaped the demons that plague thinkers. Perhaps London’s Little Ease dungeon he speaks of in Telling Secrets is the same as my fear, my darkness, and my self-doubt. A deeper theme Buechner develops in his darkness, is how God works through pain and trial to communicate His loving forgiveness. At the funeral for my father and baby brother, a nun said, “you are truly blessed to have received so many tragedies.” It was a horrible, yet relieving thing to hear. It felt like this woman was the first to acknowledge my true pain, yet she did it without saying “sorry.” In his pain, Buechner learned a secret lie that had haunted him: he believed that if someone he loved was unhappy, he had no right to be happy. Even in his most recent memoir, Eyes of the Heart (1999). Buechner does not share whether or not he has conquered this lie, or whether he still stumbles in the unhappiness of his loved ones. One of the truths that comes out of Buechner’s life is that telling the truth about our lives is important, but it does not mean that lies have been extinguished. 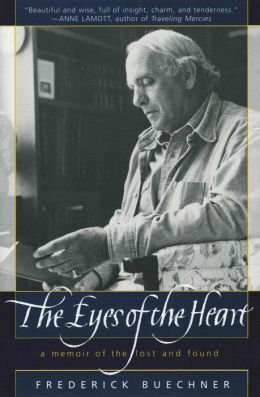 After reading his autobiographies, I feel connected to Buechner in many ways. It has been a delight to walk with him along the journey of his life. Buechner is clearly reflective and self-aware, bringing out parts of my own life and much about the life of God. His writings are an exegesis of the soul, pointing toward truth, and he walks there with us in his meandering, storytelling way. This entry was posted in Reflections, Reviews and tagged Autobiography, Bebb, C.S. Lewis, Charles Williams, Frederick Buechner, Inklings, J.R.R. Tolkien, Memoir, Spiritual Autobiography, spiritual memoir, Telling Secrets, The Book of Bebb, vocation, writing. Bookmark the permalink. I have never heard the phrase “bird course.” Any idea where it comes from? Also, while I feel I understand what the nun meant by “you are truly blessed to have received so many tragedies,” something about the words used to express it rankle. Maybe it’s too easy to misunderstand, and maybe I’ve known too many people (even one is too many) who have been wounded by words like that in times of pain. Ah, “bird course’ might be a local phrase–basket weaving? It’s easy, too easy. We used to have “Rocks for Jocks” here at the university. Every school has something. Anytime we speak we take a big risk. And when we speak into a painful moment–well, the risk is high. This seemed to work, but imagine all the times someone has used the idea of “blessing in pain” as a blunt instrument. There was an elegance in this moment for me, though I can’t speak for those around me. Funny. It must be a local colloquialism. I read it more literally, thinking that for some odd reason your teacher had refocused the class on his personal ornithological avocation. This is true. I am glad that it struck you right, in any case. Thank you for (1) encouraging me to revisit Buechner’s work, and (2) sharing such a candid portrait of your own life. Thanks Rob–go back to his work. It is always a rich return. I TOO HAVE BEEN BLESSED BY BUECHNER’S WRITINGS. HE HELPED ME LET GO OF MANY OLD FUNDAMENTALIST TEACHINGS THAT HAD BEEN SO REPRESSIVE TO MY CHRISTIAN LIFE. HE WOULD DEFINITELY FIT WELL WITH C.S. AND THE INKLINGS. The decision to attend seminary came as a surprise to Buechner’s friends and family. According to Buechner, “People who admired me as a writer were by and large either horrified or incredulous. Even George Buttrick, whose extraordinary sermons had played such a crucial part in my turning to Christianity, said it would be a shame to lose a good novelist for a mediocre preacher.” (Now and Then, p. 12) Clearly, it was a major turning point in his life. From this point on, faith, holiness and religion would become major themes in Buechner’s writing. Hello Brenton. Thank you for sharing these wonderful reflections! I work for Mr. Buechner and take care of his website, Facebook page, etc. Would you mind if we reposted your article on the blog on his website? (www.frederickbuechner.com) Thanks! Hello! First, I must say that you have about as cool a job as I can imagine! Second, I would absolutely love to have that article re-posted. It is a bit amateurish–I was young when I wrote it–but I posted it here because it struck me still to be true. So, it would be a great honour. Those Buechner memoirs came to me in a class by Eugene Peterson at Regent College, and it was truly a watershed moment for me. I have lived my life in the dozen years since based on the principles of that article. I am also now the Tutor for Peterson’s distance courses at Regent, so I get to revisit this material frequently. I suspect others have found Buechner’s work through Peterson’s influence. I know that Canadian singer-songwriter, columnist, and Regent College alum Carolyn Arends names Frederick Buechner as an important influence in her writing. So, best wishes. If you need anything, contact me at junkola [at] gmail [dot] com. Great! Thanks Brenton. I will send you an email as well.